Touted as a preseason Heisman candidate, Marshawn Lynch quickly fell off the radar after the Tennessee game, much like his team did in the national championship picture. Now, Marshawn is making a strong push for, at least, a spot at the ceremony in New York. Coach Tedford is also making a push for Marshawn stating, "I find it hard to believe that there are many football players better than him in the country." Below I list some popular Heisman watch lists and where Marshawn currently sits. 5. Marshawn Lynch, Cal, RB, Jr.
Heisman-o-meter: A member of this list last month, Lynch had been flirting with making a return. He finally does so after an impressive effort against the Huskies. Though he didn't start because of two sprained ankles, he dominated in the second half, once turning an aborted halfback pass into an impromptu cross-country tour that ended just shy of the goal line. He's here to stay. Both his ankles may have been barking, but Lynch's mind was telling him to forge ahead in Cal's first tight game since the opener. 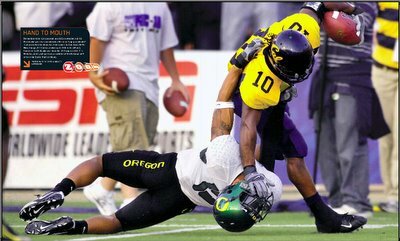 With Washington refusing to go away, he carried the Cal offense in the second-half scoring the go-ahead touchdown late in the fourth quarter and the game-winner from 22 yards out after the Huskies sent the game to overtime on a Hail Mary pass at the end of regulation. Heisman Pundit has Marshawn at #6. ESPN has him at #9. Looks like a strong game in a victory at USC would push him into Heisman contention even further. Jay Heater, Contra Costa Times has an interesting story about Marshawn's Heisman hopes (read article here). 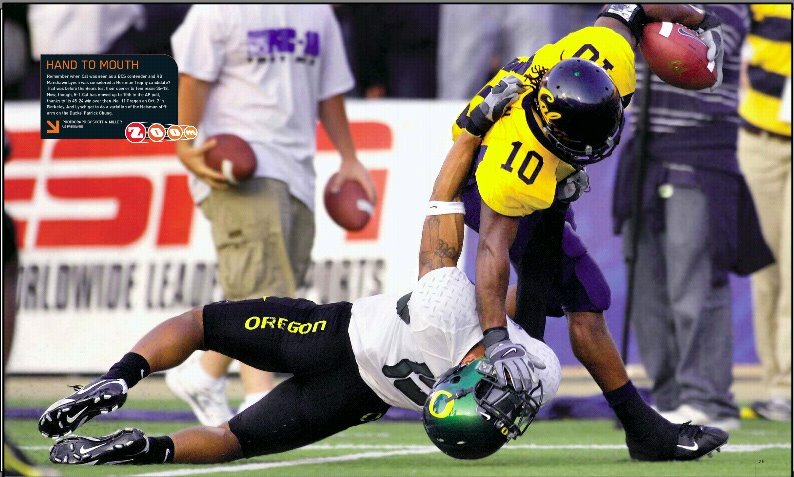 In his blog he even talks about how Marshawn's cart ride might have even helped his Heisman campaign (read blog here). Like they say, there's no such thing as bad publicity. Best of luck to Marshawn, but Troy Smith is running away with this award. Personally, I can't wait for the Desean Jackson Heisman push next year (www.djax1.com??). Remember Desmond Howard winning the Heisman? Now picture DJax making a diving TD catch next year against USC at Memorial Stadium then striking the Heisman pose on the back of a injury cart that Longshore is driving across the field. Post game celebration. Lynch on a golf cart and Oskie being rolled up. Only in Berkeley. Sports Illustrated just listed the top 15 QBs in the nation. 1) Pat White is a running back. I don't care if he takes the snap, he is a running back in a wishbone offense. He is a great player but not a top 6 QB. 2) Brian Brohm has been injured and did not look that great last week when he came back. Is this based on reputation or actual play. 3) If this list was posted last week, I believe both Chris Leak and Chase Daniel would be higher. 4) Numbers 10-13. Who, who, who and who? Just kidding, I know who these guys are but top 15 in the nation. Maybe it is a down year for QBs. 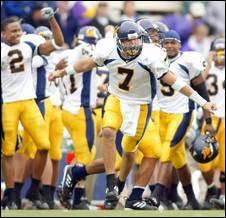 Kyle Boller and teammates celebrate 34-27 victory over Washington in 2002 to end 19 game losing streak to the Huskies. Great photo of Marshawn Lynch unintentionally striking a Heisman pose right into Patrick Chung's grill. Glad to hear the ankle is better.